* Spoty Mountain Bike Frame Design. The MOTAN M-850 P7 features a sporty,strong, curved top tube anchored at both seat post and the ends with long travel suspension. The frame and swingarm are both curved for styling, strength and clearance for the fat 4.0" Kenda tires bring extra agility.Addmotor MOTAN M850 P7 is designed to handle any terrain, giving you the freedom to ride anywhere. 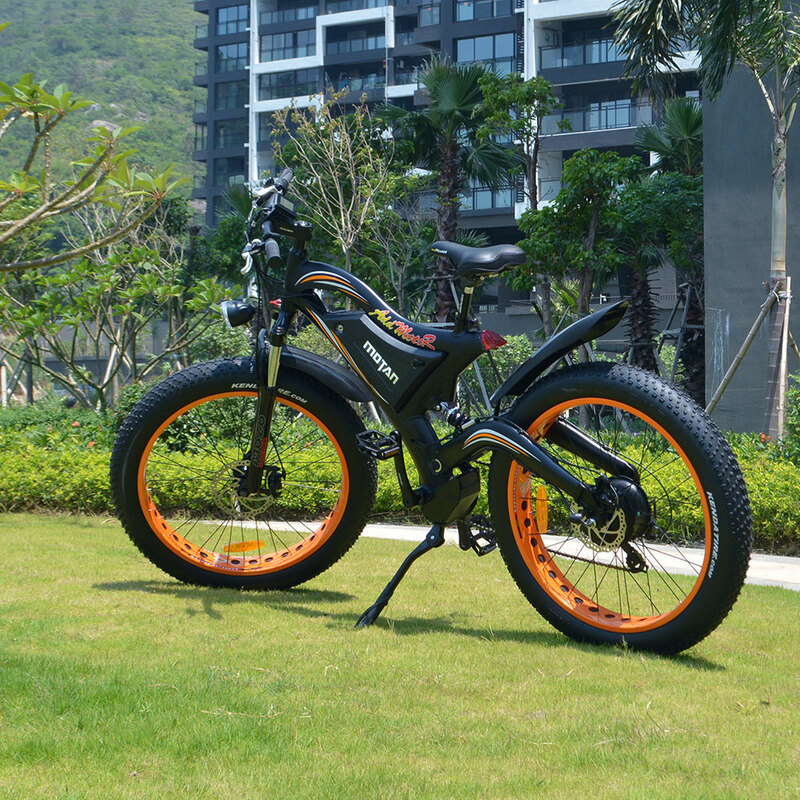 * Large Power 750 Watt Motor and High Capacity Battery. 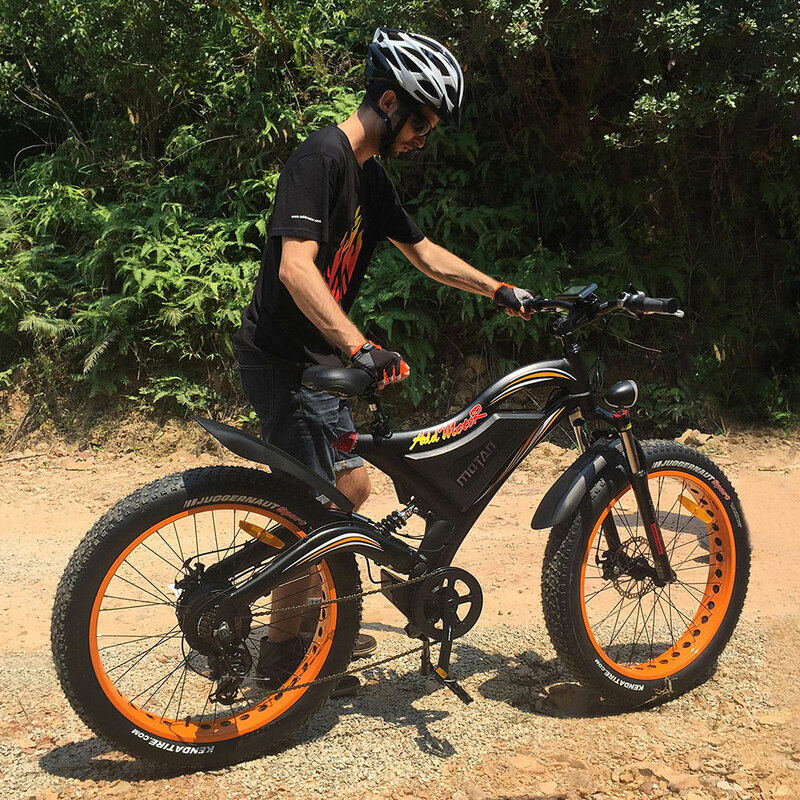 With its rear hub mounted 750 watt brushless motor and 48 volt 11.6AH lithium ion Panasonic battery, the M850 P7 has the power and range to accompany you on adventures of almost any length and duration on a single 4 hour charge,charging time depending on the battery status. You never have to worry about endurance. With 750 watts of power you can easily reach up to 25 miles per hour on battery power alone. * Dual Suspension. Featuring a Aluminum 100mm Travel Suspension front Fork and Aluminum Alloy rear Kingshock Spring Absorber,MOTAN M-850 P7 combines comfort and appearance with dual suspension for a travel in tough terrain. * Addmotor 5 Inch LCD Screen Display. 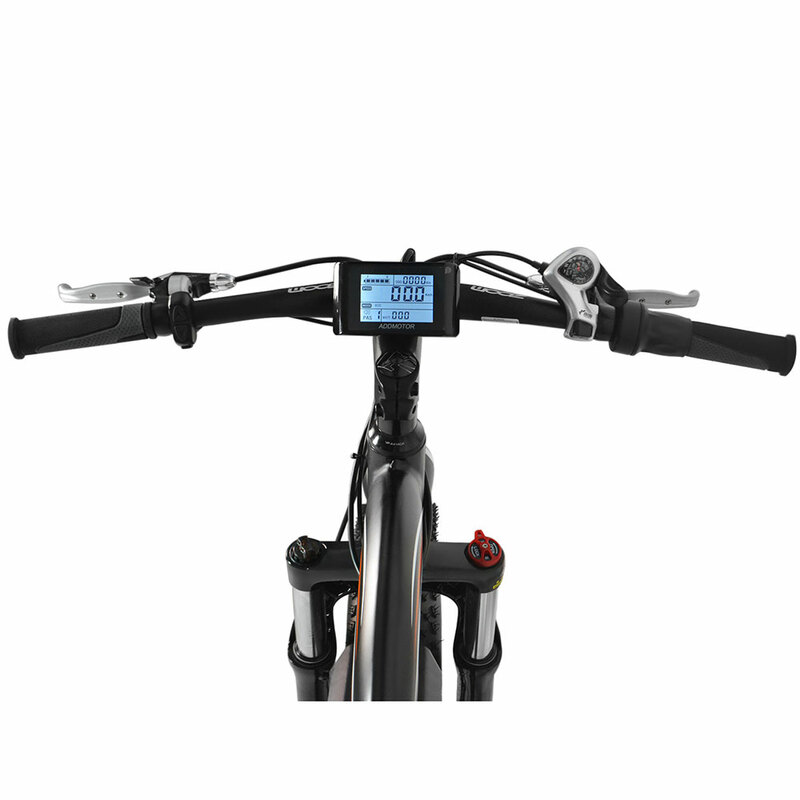 A 5 inches LCD display is mounted on the front tube which comes with a USB port to charge your phone or electronic device on the go.The large bright display show the parameters clearly including battery status,speed,trip distance and riding mode,all these features can well meet any of your need,easily to glance the health of the bike on road. * Use Electric Power or Pedal Assist or Muscle Power to Move Along. The M-850 P7 offers three modes to choose from : muscle power, electric pedal assist, or full electrical operation, for a an effortless cruise. * Equipped With Front and Rear Fenders. 2018 MOTAN M-850 P7 new design upgraded 750 watt motor, 11.6AH Battery. MAX Speed is 27 mile, allows you to even climb vertically to 60 degrees. 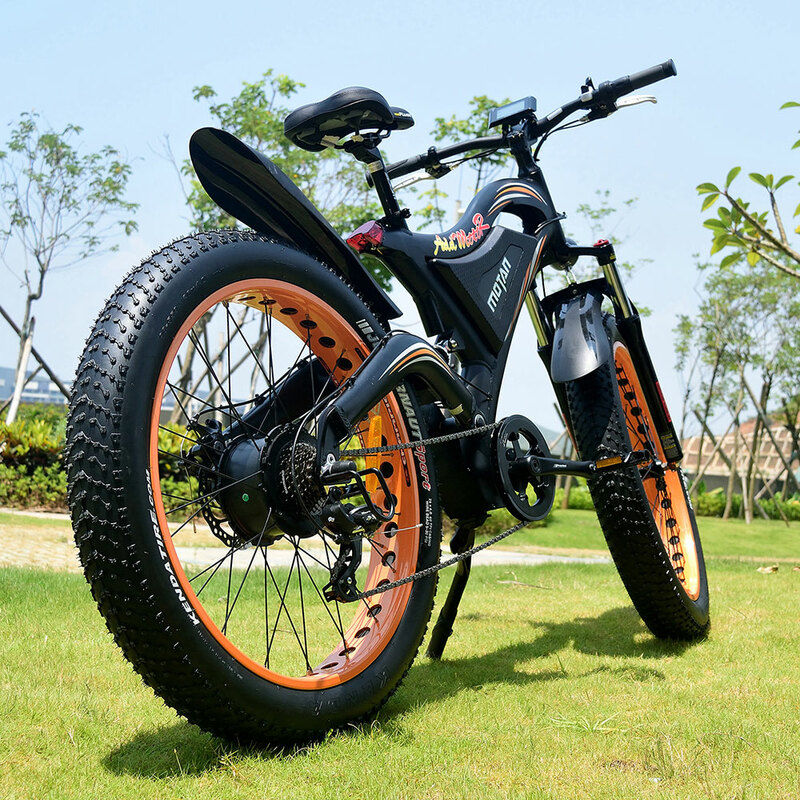 If you want to find Double suspension /Fat tire Monster E-bike, if you want to get the attention of everyone, M850 is your best choose. 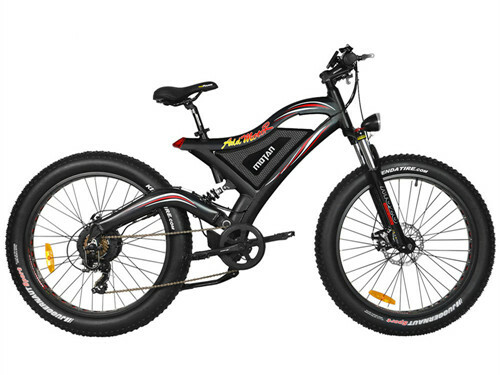 Whether you are an avid bike rider who want, this is also a select that you will not regret. Because it has brought to you a lot of enjoyment. Double suspension with stiff and durable alloy frame and a cool design gives you the “wow factor. With cool design, so many people say "wow" when you ride it. It will be your favorite bike you have ever owned. The bike is an absolute blast to ride and a total lifesaver for your daily commute through the city. The seat and fat tire provide extra comfort for long distance riding. With night mode LCD ensured visibility at night.USB charging port on the display can help you to charge your devices while you're riding. Warranty: Technical Support 2 Years. Motor and Battery 1 Year Warranty.